It shows the enormous galaxy cluster Abell 1689 and apart from being visualy appealing, the image is also full of cool physical effects that I would like to point out. 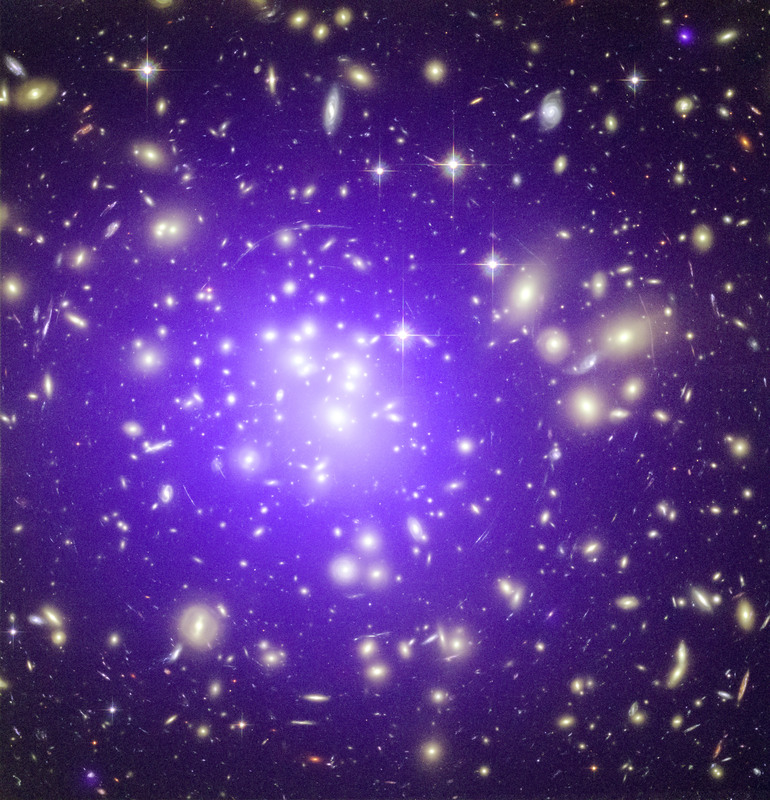 Let’s start with with the purple x-ray glow coming from the center of the massive galaxy cluster. It originates from extremely hot gas in the center of the galaxy cluster. Reportedly, the gravitational forces at play in that region cause the gas to heat to over a 100 million degrees Celsius. Also, the same purple region is predicted to contain large amounts of dark matter (matter we can’t directly measure, but has to be there in order for the gravitational fields to be as they are). How intens the gravitational fields are in the center region of the cluster is also apparent from another, in multiple ways cooler, physical effect; gravitational lensing. The theory of gravitational lensing relies on Einsteins theory of general relativity. This may sound scary, but as long as we stay away from the math, there is nothing to worry about ;). To illustrate how this effect works I will borrow a figure from elsewhere on the webweb. 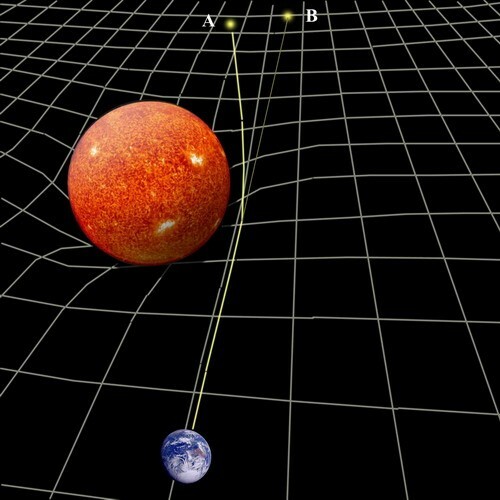 Einstein’s theory of general relativity tells us that spacetime (simply picture this as space) is curved in the vicinity of very heavy objects. The huge galaxy cluster Abell 1689 significantly curves spacetime and this curved spacetime deflects light from its straight path as is illustrated in the image above. 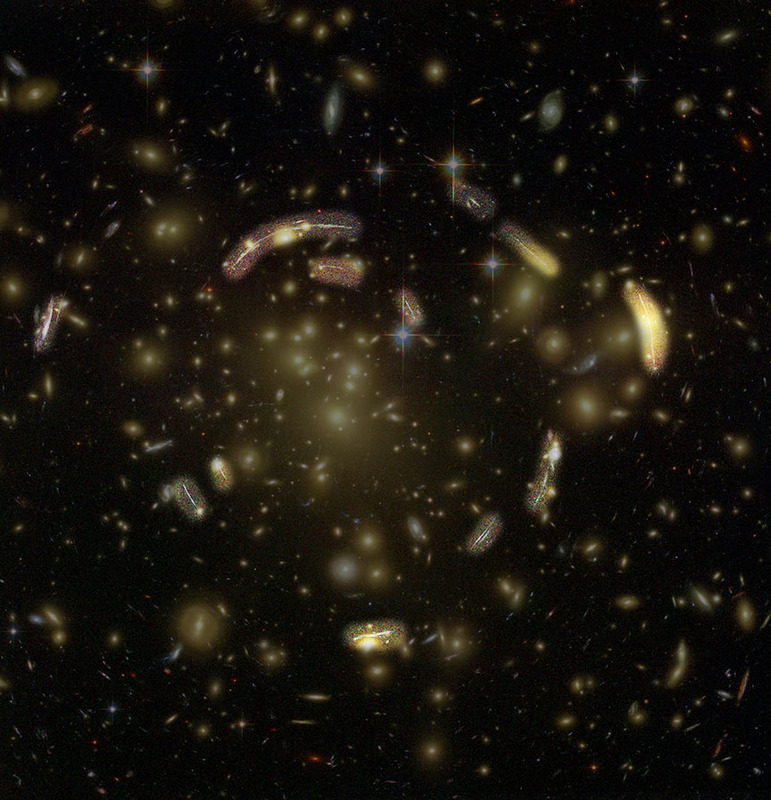 The complex shape of the gravitational field in Abell 1689 bends light from galaxies behind it towards earth so that a single object appears to be at multiple different places at once. Taking into account that this lensing of course distorts the image intensely, what we expect to see are some vague blurry objects with odd shapes that don’t seem to belong there. This is exactly what is visible in the image that this article is about. In the image below (Hubble data only) I have highlighted the lensed images. Look them up in the original image. One more effect I would like to point out is the diffraction due to the telescopic design. The brightest stars in the image are not simply bright dots as one would expect from a spherical star, but look more like crosses. These 4 ‘spikes’ that surround the center star are know as diffraction spikes. They are caused by the structure that supports the secondary mirror in the telescope. This structure is comprised of several (4 in the case of the Hubble Space Telescope) bars that keep the secondary mirror in its place as is shown in the graphic below. The diffraction is due to the interaction between light passing on either side of the support bars. But how is this possible if light moves in a straight line? Well, as light is not purely particle-like of nature, but also behaves somewhat as a wave, part of the incoming waves may ‘bend around the bar’ a bit. The diffraction pattern shows what is known as the ‘Fourier transform’ of the light. Which means that it shows the spectrum of frequencies present in the incoming light. 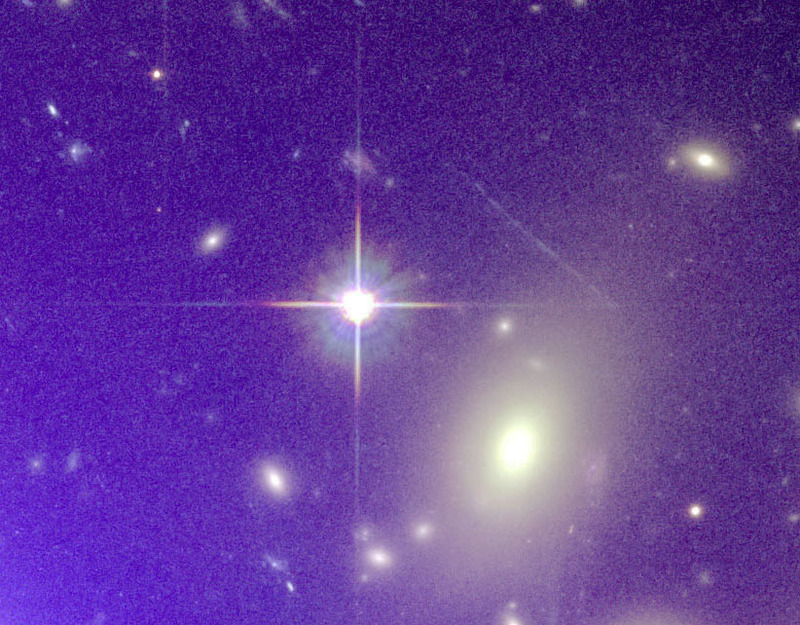 This is also clearly visible in the image of Abell 1689. Below you see an excerpt of the bigger picture, clearly showing the different colors in the spikes. Not only the Hubble telescope shows this diffraction pattern, but amateur telescopes with a similar design do to. In fact, my telescope has 3 such bars which shows 6 (albeit less pronounced) diffraction spikes around bright objects. A while ago I imaged Deneb, a blue-white supergiant star weighing about 20 solar masses, and the resulting image showed some cool diffraction spikes. 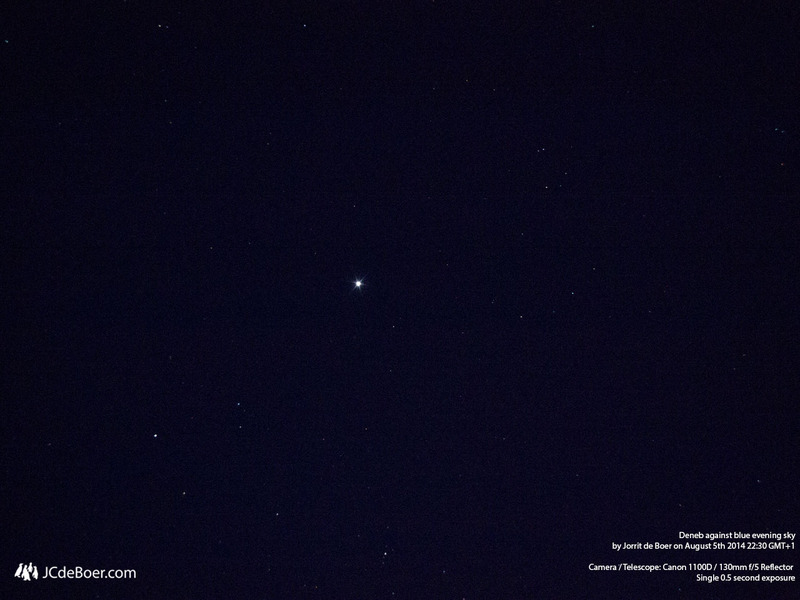 Single exposure of blue-white supergiant Deneb. Clearly visible are the 6 diffraction spikes due to the 3 bars that obscure the view. This entry was posted in Astronomy, Astrophotography, Physics and tagged Abel 1689, Chandra, diffraction, galaxy cluster, gravitational lensing, Hubble, telescope, x-ray. Bookmark the permalink.